In yet another initiative to reduce pendency of court cases in the state, Chief Justice of the Himachal Pradesh High Court Kurian Joseph today announced a new project. Expressing his disappointment over a call given by doctors to boycott emergency services from August 12 to 14, Health Minister Rajeev Bindal said here today that there was no justification for the proposed action as the government had already accepted their genuine demands. Palampur Agriculture University has amended its academic rules as per the provisions of the Himachal Pradesh Educational Institutions (Prohibition of Ragging) Act, 2009. The Shukla committee set up by the high court to examine the environmental fallout of big projects of over 100 MW in the state has recommended that a minimum riparian distance of 5 km be maintained between two projects on the same river and the projects which did not conform to this requirement and had not yet received environment clearances should be put on hold until the entire issue was examined and a proper policy framed. The decision of the government to fill 150 posts of medical officer in the Health Department on regular basis has further enraged veterinary officers who have been alleging discrimination. More than 5,000 residents of Nandrul, Kharat and Rajal villages in this sub-division are facing water crisis as the Nandrul-Rajal water supply scheme has been closed following heavy rainfall. Taking a lesson from the recent Leh cloudburst and flash flood that killed over 200 people so far, scientists, meteorologists and glaciologists cautioned the local civil administration not to allow houses, labour colonies, Army and ITPB camps in or near the flood plains of the rivers, rivulets, even dry water channels. A case of fraudulent land deal involving sale of 61.18 bighas through fake sale deed has come to fore in the Baddi industrial area with the registration of a case against the owner for forgery and cheating. The common man can now register complaints and suggestion pertaining to various government departments and agencies from the Lok Mitra Kendra using the e-samadhan service. BJP national general secretary and former Forest Minister JP Nadda will take up the matter of the long-pending demands of state pensioners with the Chief Minister. This assurance was given by Nadda to a deputation of the district unit of the Himachal Pradesh Pensioners Welfare Association at his home village, Vijaypur, near here, on Monday. The North Super 30, popularly known as a factory of producing engineers, today organised a seminar at local Laureate Public School to motivate students and help them prepare better for various competitive examinations. In yet another initiative to reduce pendency of court cases in the state, Chief Justice of the Himachal Pradesh High Court Kurian Joseph today announced a new project to create a litigation-free village in each district over the next one-year. The project will be implemented by involving the nine law colleges in the state which are already running legal-aid clinics. Students of the colleges will carry out surveys to collect necessary information like details of pending cases in various courts in association with the district legal services authority to help identify villages. The process will be completed within three months. Once the villages are selected the focus will be on speedy disposal for which alternative methods of dispute redressal, including mediation, lok adalats, settlement by conciliation and arbitration, will be used, Justice Kurian explained. Besides support of panchayat functionaries, cooperation of the local people would be required to make the project a success. This would be achieved by ensuring effective functioning of the legal-aid clinics. In fact, the long-term objective was to make the legal-aid clinics as centres for providing guidance to people living in villages and in and around them which they could visit for consultation even before filing a case in the court. The next target will be to have litigation-free panchayat in each district, he said. Referring to pendency of cases in the high court, Justice Kurian said number of cases had come from 54,000 to 45,000 since he took over. Some of the pending cases pertained to 1987. The aim was to clear the pending cases up to 2001 by the end of the current year which would bring down the number of pending cases to around 20,000. As almost 75 per cent of the cases pertained to service matters of employees and the matter would be taken up with the government for putting in place some in-house mechanism for dispute redressal to reduce litigation. To ensure prompt disposal of cases, involving senior citizens, Justice Kuldeep Singh had been assigned the task of monitoring such cases. Similarly, Justice SS Thakur would monitor mental health cases, while Justice Sanjay Karol and Justice VK Ahuja would take care of juvenile cases and jail matters, respectively. He said the boycott of emergency services tantamount to playing with the life of patients which was intolerable. He said the government would not tolerate any anti-public action on the part of doctors. He said during his recent Kangra tour representatives of the Medical Officers’ Association, RKS doctors and contractual doctors held detailed discussions regarding their demands after which it was decided that the recruitment of doctors would be carried out through the state public service commission which had been stopped for the last many years. Further, location-based incentives of Rs 3000, Rs 6000 and Rs 9,000 per month was extended to 63 contract doctors on the analogy of Rogi Kalyan Samitis and a decision to make regular recruitment of 150 doctors was also taken. The government had been considerate towards the demands of doctors and it gave a special relaxation to provide benefits to them. Keeping in view their interest the government decided to increase reservation for in-service candidates in postgraduation course from 66 per cent to 95 per cent. As such it was inappropriate on their part to issue press statements conveying an impression that emergency services would be boycotted from tomorrow, he added. Vice-Chancellor of the university, SK Sharma gave this information while addressing the first meeting of the anti-ragging committee today. He said the Himachal Pradesh Educational Institutions (Prohibition of Ragging) Act, 2009 would be implemented in letter and spirit in the university. The Vice-Chancellor said in the light of UGC draft regulations on curbing the menace of ragging in higher educational institutions, 2009 and further the Himachal Pradesh Educational Institutions (Prohibition of Ragging) Act, 2009, the university has amended its academic regulations. Academic Regulation 301, a 20-page document, unambiguously explains ragging, authorities to exercise powers to control ragging, administrative action in the event of ragging and action to be taken by the Vice-Chancellor. Even mechanism for prevention and enforcement of this Academic Regulation has been detailed like sensitisation programmes, setting up of high-powered committee and constitution of anti-ragging committees of faculty and non-teaching staff. S.K.Sharma said he would ensure that students stayed and studied in the most cordial atmosphere at the university. He expressed the hope that the students would not indulge in any activity whatsoever which came under the definition of ragging. If any such incident occurs due to some reason or another, he will take strictest possible action under rules. Lalita Sharma, Students Welfare Officer, detailed steps taken by the university to control the menace of ragging in the current academic session. About two dozen members representing various categories like the police, the administration, students’ community and non-teaching union etc participated in the meeting. The report has highlighted glaring deficiencies pertaining to environment management not only in the private sector projects but also those being executed by government agencies like the NHPC and the NTPC. Stressing that the government should carry out the environment impact assessment basin-wise instead of the existing project-wise system covering all the river basins and till this exercise was carried out, no more projects be allotted and in case of those already allotted the environment clearance should be withheld. This was precisely what has been ordered by the Forest Advisory Committee of the union ministry of environment and forests in respect of more than 100 proposed hydroelectric projects in the Ganga basin. The committee found the main valleys saturated with projects and now moving to tributaries but the effect of large-scale felling of trees, dumping of muck and diversion of river water over the entire basin had not been studied by the government before allotting projects. Further, mandatory conditions to release 15 per cent discharge in the river at all times was mostly not being followed. In cases where it was being complied the quantum was so small that it hardly made any difference. It recommended that besides maintaining minimum distance of 5 km between the tail race of one project and the intake of the next project downstream, the government should also declare some areas as “protected zones” under the environment protection act to help maintain ecological balance. The report has virtually put the government in the dock and virtually endorsed the view of the environmentalists that hydroelectric projects were playing havoc with the fragile hill-environment. 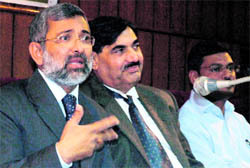 The veterinary officers recruited on contract basis are upset that instead of implementing their demand for parity with medicos, particular in matters like non-practising allowance (NPA), casual leave and regularisation of service, the government decided to make regular appointment of doctors, despite notifying a six-year policy for their regularisation just two months ago. It betrayed the partisan attitude of the government towards the veterinary officers as it was bound to ensure parity in their pay scales, allowances and service conditions with the medicos. They resented that under the present government one particular category was being given extra special treatment by doling out one benefit after the other and at the same time denying even rightful dues to veterinary officers appointed on contract basis who have been at the receiving end. Ever since 2003 when the veterinary officers were appointed for the first time on contract, till date their case for regularisation had not been taken up by any government. None of their demands have been met despite assurances and even the 68 posts of veterinary officer cleared by the Cabinet about a year ago had not been filled as a result no fresh appointments could be made in the department since 2007. The scheme was lacking a filtration plant and residents were forced to fetch water from hand pumps located at long distances. Rajal village pradhan Viryiam Singh said 400 families of the village, 350 of Nandrul and 250 of Kharat village were receiving water supply from the Nandrul-Rajal water supply scheme, adding that the scheme lacked proper filtration plant. He said with the onset of monsoon, the Manooni and Manji khuds, which were the sources for the scheme started receiving muddy water and the scheme was closed by the IPH authorities for the want of the filtration plant. He said Rajal panchayat had passed a resolution time and again demanding that the IPH Department should set up a proper filtration plant at the source of the scheme, but to no avail. He said villagers even approached Chief Minister PK Dhumal at Hamirpur in May this year, who ordered a speedy redressal to their grievances, but the IPH authorities failed to implement even the directions of the Chief Minister. The IPH authorities here confirmed that the scheme had been closed till monsoons were over. However, the villagers demanded that a filtration plant be set up so that the scheme continued to supply water during the rainy seasons as well. In a cursory survey by the Centre for Regional Development (CRRD), JNU, New Delhi, glaciologists found that houses, labour colonies and certain Army and ITBP camps lie within the flood plains of the rivers and rivulets in Kinnaur, Lahaul-Spiti, Kullu and Leh region. He said the Tibetan settlement colony was set up at Chaglansar in 1960s along what was then a dry water channel feeding the Indus river system on the right bank. He cautioned that the Leh-like disaster were avoidable if the administration did not allow houses, labour colonies and other settlements along the flood plains. Dr Milap said the Beas had been diverted thrice in the recent past. But houses, resorts, dhabas and labour settlements have come up right from the Bahang upstream of Manali through Kullu town and Bhuntar in the flood plains of the river. Similarly, in Mandi town private multi-storeyed resorts, dhabas and auto showrooms have come up in the flood plains of the Beas and its tributaries — Skiodi Khud and Suketi river. In Lahaul-Spiti, dhabas and new houses have come up along the Chandra and Bhaga rivers in Koksar, Sissu, Tandi, Darcha on the Manali-Leh highway and Udaipur and Tindi panchayat on the Udaipur-Killar road, sources revealed. Meteorologists and scientists warned that the civic administration in these districts should pay attention to mushrooming development along the riversides. According to the case details, one Hem Chand Sharma, a resident of Panchkula, had availed a loan of Rs 12.4 crore from the Baddi-based branch of the SBI after mortgaging his 75.4 bighas. But he sold a portion of this land measuring 61.18 bighas to one Rakesh Bajaj of Delhi after preparing a fake sale deed on September 2006. This land was sold through an agreement and he managed to pocket Rs 2.2 crore as its first instalment of the total Rs 7.35 crore for which the sale deed was executed. Bajaj, however, failed to get the land registered as he was sold the land on a fake sale deed. Having being duped he initially filed a case of forgery against Sharma at Delhi in February, 2007, but the case was later transferred to Himachal on the plea of jurisdiction. The police registered the case in January this year after receiving directions from the court but it failed to arrest Sharma. Having failed to get land, Bajaj was forced to turn to Uttarakhand where through making use of the central industrial package he initiated a venture. Thus, the state lost out on crucial investment as a prime investor fell in wrong hands and wasted his money and time in looking out for an appropriate piece of land for initiating an industrial venture. The Baddi SBI took over the land after Sharma failed to repay the loan and it sold it to recover its loan thus proving how a fraud had been committed in selling the mortgaged land. A spokesman of the Information Technology Department said here today that citizens could use the facility on a payment of Rs 4 per complaint. The status of complaint could also be monitored. Similarly, citizens could register their names on the website of the Election Department through the Lok Mitra Kendras on a payment of Rs 5 per registration. A notification in this regard had been issued by the department. BJP national general secretary and former Forest Minister JP Nadda will take up the matter of the long-pending demands of state pensioners with the Chief Minister. This assurance was given by Nadda to a deputation of the district unit of the Himachal Pradesh Pensioners Welfare Association at his home village, Vijaypur, near here, on Monday. State association senior vice-president JK Nadda and executive members Prem Lal, MN Bakshi, OP Garga and Krishan Lal Upadhyaya were among those who accompanied the deputation. The deputation stressed that as promised by the BJP in its manifesto, the pensioners be given all benefits and facilities being provided by the Punjab Government to their pensioners and be given 5 per cent and 10 per cent pension increase on the age of 65 and 75 years, Rs 500 monthly medical allowance, one-month pension additional in every two years as LTC and clearance of all pending medical reimbursement bills. Vice-chairman of the organisation Kaumarya Manoj said the North Super 30 programme in the state would be funded by the Vidya Mandir Classes, Delhi, and IIT Study Circle. The state government was also supporting the initiative to enable the economically disadvantaged students of the state to compete at the national level.